Well, tonight is your last chance to stockpile some extra chips to bet on Sunday’s Super Bowl. Thankfully, UFC 169 offers up some interesting investment options, including a pair of championship affairs. However, both champs are heavy odds-on favorites to retain their thrones. 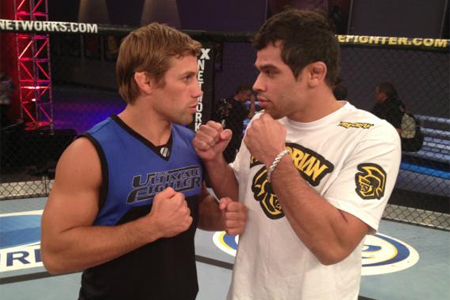 Bantamweight title holder Renan Barao is more than a 3-1 favorite to beat Urijah Faber (both pictured) in Saturday’s featured contest. Faber checks in as more than a 2-1 underdog. Featherweight king Jose Aldo is pegged as a whopping 7.5-1 favorite to steamroll Ricardo Lamas in the co-main event. Lamas, meanwhile, comes in as nearly a 5-1 longshot. Prudential Center in Newark, New Jersey serves as host.